A site-specific artwork was developed for the new building of the German Research School for Simulation Sciences (GRS), reflecting the work conducted there from the point of view of an artist. The surface of a two-storied wall of the exterior façade, which is to be re-designed, is interrupted by two small windows one lying above the other, the wall is framed by a bright orange wall-segment and a glass entrance. Interconnectedness is the title of the basic concept of the artistic design: Studying at the GRS “interconnects” elite students from various disciplines and from all over the world. Highly motivated and focused, they cooperate in the development of complex thought models for simulations; this extensive network of shared programs is ultimately computed by one of the world’s largest, privately owned supercomputers. The circle is the symbol for totality, for unity, for complexity – for utmost concentration. In Jülich, it symbolizes the coming together of students from all parts of the globe. Formally, the circle picks up on the curvature of the roof; it is truncated on one side and leads into the interior of the building. The circle has a calm, earthen basic color that enters into a natural symbiosis with the orange color of the wall on that side. A web is inscribed in the circle. Trains of thought from various disciplines of the natural and engineering sciences are connected with each other at the GRS. The most diverse personalities from all corners of the world “interconnect” in the study of simulation. The web has no beginning and no end, it is a segment, is in the process of growing, is incomplete but permanently in creative development and expansion. For the lines the color green is adequate, it is the color of growth, the color of development. The interconnections in the web visualize insights, results, and attempts at solutions within these interconnected trains of thought. As signals they are emphasized through bright colors. The study of simulation is the third main research element besides theory and experimentation and is therefore important and groundbreaking for the future of the sciences. This is visually illustrated through the energetic radiance with bright long-range visibility. 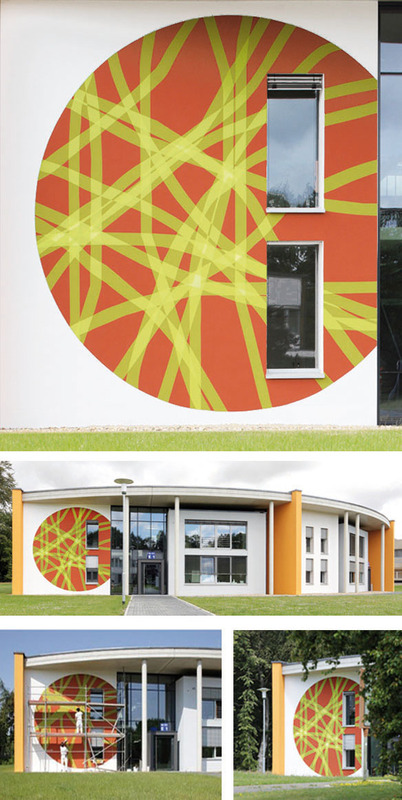 The design “Interconnectedness” reflects the interior life of the GRS on the building envelope, actually reverting it to the exterior and in this way supporting the presence of the study of simulation at the Research Center Jülich.